An extraordinary exceptional book -- the best book I read in 2013. Kent Krueger’s novel belongs on the shelves of readers’ hearts and minds somewhere between Stephen King’s “The Body” and Ray Bradbury’s Dandelion Wine. At the turn of the 21st Century, Frank Drum reminisces about the summer of his 13th year, growing up the son of a Methodist minister in a small Minnesota River Valley community. A series of events, including accidental deaths, murder, and the revelations of deeply-held secrets, test the characters’ faith and family bonds. Kent creates prose that resonates with readers who will care passionately about this story, even if they have no personal connection to the mid-Century middle America of the setting. New Bremen, Minnesota, 1961. The Twins were playing their debut season, ice-cold root beers were selling out at the soda counter of Halderson’s Drugstore, and Hot Stuff comic books were a mainstay on every barbershop magazine rack. It was a time of innocence and hope for a country with a new, young president. But for thirteen-year-old Frank Drum it was a grim summer in which death visited frequently and assumed many forms. Accident. Nature. Suicide. Murder. Frank begins the season preoccupied with the concerns of any teenage boy, but when tragedy unexpectedly strikes his family—which includes his Methodist minister father; his passionate, artistic mother; Juilliard-bound older sister; and wise-beyond-his-years kid brother—he finds himself thrust into an adult world full of secrets, lies, adultery, and betrayal, suddenly called upon to demonstrate a maturity and gumption beyond his years. Told from Frank’s perspective forty years after that fateful summer, Ordinary Grace is a brilliantly moving account of a boy standing at the door of his young manhood, trying to understand a world that seems to be falling apart around him. It is an unforgettable novel about discovering the terrible price of wisdom and the enduring grace of God. “Sometimes a work of fiction just comes to you, sits in your soul, touches your life experiences and then is hard to remember as fiction. 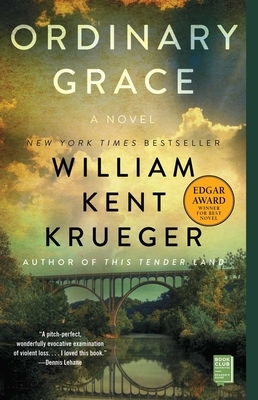 Ordinary Grace by William Kent Kruger is such a novel."